Amongst the rich repertoire of embroideries known and practiced in India, the Chamba Rumal , a narrative style of embroidery, stands apart as being unusual and striking both visually as well as in the beauty of its concept. It takes its name from the historic city of Chamba, in Himachal Pradesh, where it is still commonly practiced. Chamba is a small picturesque town perched on a hilly ridge rising above the gushing waters of the river Ravi (Irawati). Embroidery was practiced in these regions from early times. 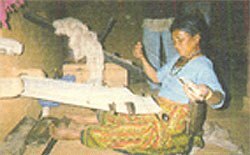 Women were known to embroider their cholis (blouses) and embroidered scarves, which were also called rumals, were worn around the neck of the men folk. This practice was widely spread in this entire region which included the neighbouring towns of Guler, Nurpur and Basohli. It is interesting to note that these towns also became associated with their special ateliers of miniature painting. However, it was the Rajas (rulers) of Chamba who in the 18th and 19th centuries fostered and encouraged this particular style of embroidery which then came to be known as the Chamba Rumal. Rumal means a kerchief, in this case a square piece of embroidered cloth. It was used as wrappings for auspicious gifts and as coverings for ceremonial dishes. Even today, during marriages in Chamba, rumals are exchanged between families of the bride and groom as a token of goodwill. Pahari miniature paintings of this period are replete with imagery which show the embroidered rumal being used in this manner. It was an important social custom of the region which continues to the present day. In some of the paintings the rumals are shown as being used as part of the costumes in the form of a patka or sash. Dating back to the 16th century, the oldest known rumal is attributed to Bebe Nanki, the sister of Guru Nanak, and is preserved in the Sikh shrine in Hoshiarpur district of Punjab. The full flowering of this art however owes much to the enlightened and artistically inclined Rajas (rulers) of Chamba in the 18th and 19th centuries. At this time miniature artists fleeing from the disintegrating courts of the Moghul Empire were given sanctuary and patronage by the rulers in Chamba. 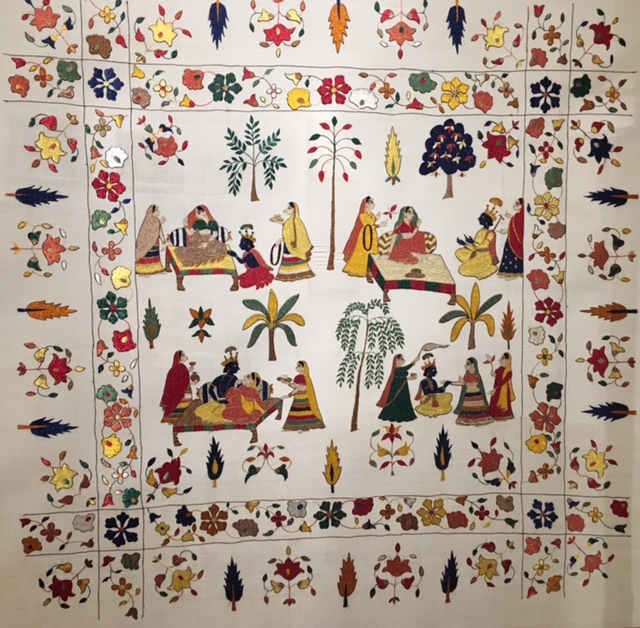 The Pahari style of miniature painting that emerged combined with the local tradition of embroidery gave birth to the rumal. For a century and a half, exquisite rumals were being produced in Chamba, most of these can now be found in museum collections. For example, in the 18th century it is recorded that Raja Gopal Singh presented a rumal with the unusual theme of the battle of Kurukshetra to the British authorities. This rumal is now preserved in the Victoria and Albert Museum in London. Raja Bhuri Singh (1904- 1919) is also reputed to have been a great patron of this art. He is said to have presented several chamba rumals to important personages during the Delhi Durbars of 1907 and 1911 where they seem to have been much admired. He was greatly influenced by the Dutch scholar Dr. J. Ph. Vogel who not only encouraged him in supporting this art but also helped him make an important collection of rumals. In 1909 Raja Bhuri Singh opened the Chamba Museum in Chamba and the collection was displayed to the public for the first time. The museum has now been renamed the Bhuri Singh Museum and presently has one of the most extensive collections of chamba rumals in the world. Fine specimens of chamba rumals can also be found in other museums like the National Museum, New Delhi, the Calico Museum, Ahmedabad, The Indian Museum, Kolkata, the Crafts Museum, New Delhi as well as well known museums abroad. Rich in detail, the distinctive appeal of the Chamba rumal lies in the fact that it is an artistic intertwining of two highly developed arts, that of miniature painting and embroidery. ‘The two can in so many ways be seen as sahodara, born of the same womb’ says the art historian Dr. B.N. Goswamy. Both these skills were and are well developed in this region. The remarkable idea of combining them to produce the rumal can be attributed to the high caliber of artistic and creative imagination which seems to have prevailed during the 18th and 19th centuries in Chamba under the discerning eye of the Rajas. It is usually a miniature artist from the Pahari School of painting who makes a free hand drawing in ink on the fabric for the embroidery. Although the themes for the rumals are both secular and religious in character, the most favourite theme is the life and legends of Lord Krishna specially the Raas Leela. Perhaps the circular format of the raas lends itself conveniently to the square format of the rumal and thus continued to be one the most popular themes. Other legends of Lord Krishna which are depicted included the beautiful Godhuli, Daan Leela, Parijat Haran,Rukmini Haran, Ashtanayika and Geet Govind. Stories from religious texts featuring fables from the life of Lord Shiva and Ganesh were also embroidered in great profusion. The secular themes included games and pastimes of the nobility like the Chaupad (dice) and Shikar (hunting). Besides miniature painting, the inspiration for the style of drawings found in the rumals is also attributed by some historians to a series of mural paintings done on the walls of the Rang Mahal (ladies chambers) in the main palace at Chamba. The palace was built during the reign of Raja Umaid Singh in the mid 18th century. There were over a hundred and thirty paintings in various sizes including smaller ones set into recesses and surrounded by heavy floral borders. These murals, now on permanent display at the National Museum in New Delhi, could also have had a strong influence on the drawings done for the rumals. After the drawing is completed, the rumal is embroidered by the local women of this region. Traditionally the skill of doing this embroidery with its special repertoire of stitches is passed on from mother to daughter. At one time, women of the royal family also practiced this art extensively. The earlier rumals were typically embroidered on unbleached hand-spun muslin fabric using untwisted silk floss dyed in natural colours. The main stitch used is a double satin stitch known as do-rukha, this ensured the exact duplication of the embroidery on the reverse of the cloth. Although laborious, this stitch can also be used to cover large areas of the fabric in different colours which appear flat and textured when viewed. The outlines and other details are worked in a double running stitch; silver wires or threads are used very sparingly but effectively to high light details such as crowns, jewellery and weapons. 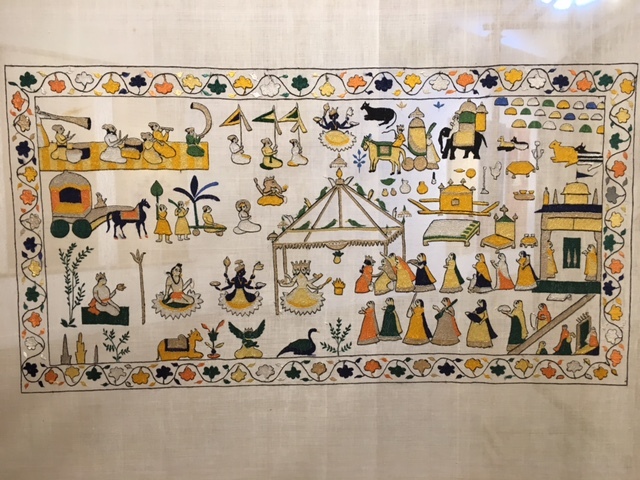 A simpler style of rumals can also be found in which the drawing is done by the women embroiderers themselves and which has simpler motifs and themes. These drawings depict everyday events and the idyllic natural beauty of the region. Some experts call these the ‘folk style’ of rumals. In the more ‘classical’ style of rumals , the elaborate floral borders, ornamentation, and the sophisticated portrayal of figures and animals as found in miniature paintings are some of the notable and distinctive features. 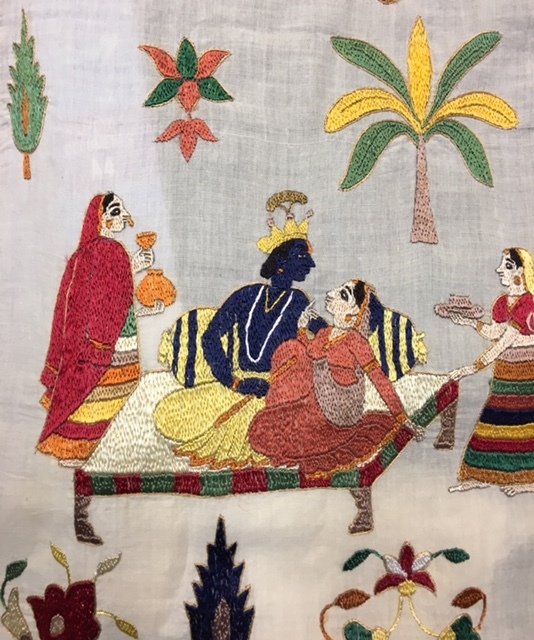 The tiny details of the facial features of the figures and their clothing as drawn by the artist are picked out with unusual skill by the embroiderers and are another exquisite feature of this embroidery. 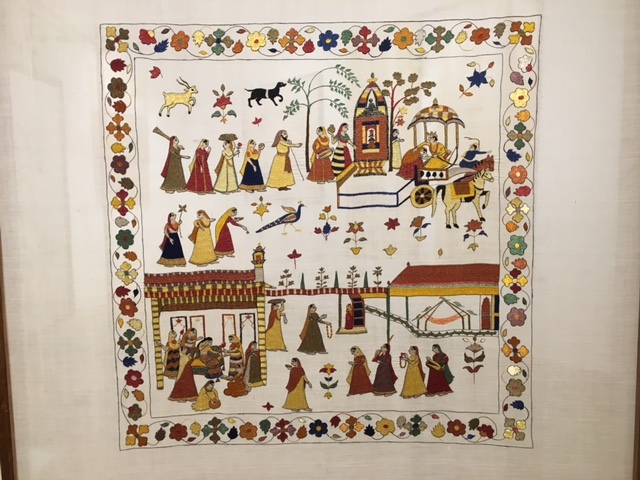 Infused with the beauty of miniature paintings, Chamba Rumals have been aptly called ‘paintings in embroidery’ by art historians and scholars like Dr. Stella Kramrisch. Exquisite specimens of chamba rumals were being made up till the early part of the twentieth century, however, towards the later part, the patronage extended by the rulers of Chamba slowly dwindled and ceased because of the political turmoil which preceded the struggle for independence. Without discerning patrons and an appreciative audience there was inevitably a notable decline in the quality of this famed art form. After independence, Kamaldevi Chattopadhyay took a very keen interest in reviving the Chamba rumal. 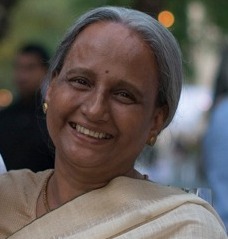 Under her direction a training centre was set up by the government. Unfortunately it could not be sustained for long due to the usual problems of official apathy and disinterest. In 1992, Delhi Crafts Council (DCC), under the guidance of Usha Bhagat, took up the revival of the Chamba Rumal as one of its projects. For more than two decades, DCC has continually striven through numerous exhibitions and workshops to spread and enhance the level of awareness about this art amongst a wider audience all over the country. Since 2003 a centre has been established in Chamba to guide and train the embroiderers in improving the quality of their embroidery as well as in the use of appropriate colours. Marketing the Rumals is an aspect to which DCC has paid special attention. Attractive packaging and information about each individual rumal that is sold has been specially designed by the Council. It is heartening that other individuals and organizations, perhaps due to increased visibility on the social media, have also recently contributed to an increased level of awareness about this rare art form. As in most traditional arts, the social milieu in which they were created is changing at an unprecedented pace. It is therefore, imperative to raise issues about their relevance and continuity. This is specially so in a revival project such as this one. Thus, reviving the rumal in the technical aspects, though challenging, is only the beginning of the journey. At DCC we have realized that what is also critical is how to keep a fresh impetus flowing into the designs, both in drawing and embroidery. Keeping this in mind new experiments have been carefully undertaken by the Council in the last couple of years. The debate and discourse we have engaged in this aspect of the project must and hopefully will continue. What is clear is that there can be no single or easy answer about the direction this special heritage art form will take in the future. Raas, The Chamba Rumal , Life to a Dying Art , catalogue published in 1999 by Delhi Crafts Council. 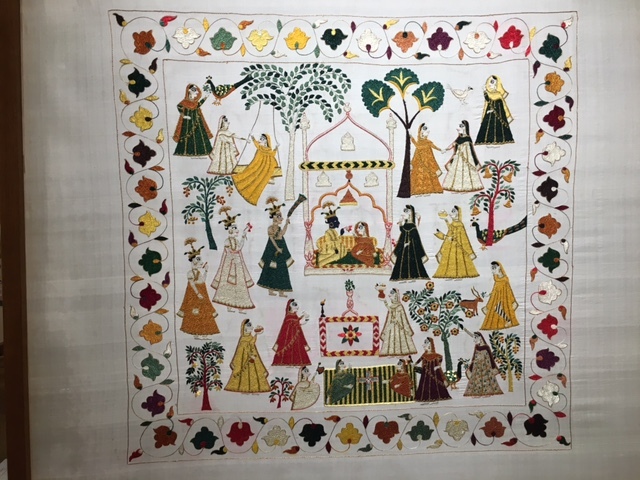 Rasamandal – in Indian Textiles, by Anamika Pathak from the National Museum Bulletin No 9, Delhi 2002. Life to A Dying art of Embroidery, by Nonika Rajkumar in House Calls, Vol 2, Issue 1, March/April 2000. Chamba Wall Paintings, from the Times of India Annual 1966.